A common (and successful) learning method is the Naive Bayes classifier. When supplied with a moderate-to-large training set to learn from, the Naive Bayes Classifier does a good job of filtering out less relevant attributes and make good classification decisions. In this article, I introduce the basics of a Naive Bayes classifier, provide an often-cited example, and provide working R code. The Naive Bayes classifier is based on Bayes’ theorem with the independence assumptions between features. The Bayes’ rule (above) plays a central role in the probabilistic reasoning since it helps us ‘invert’ probabilistic relationships between P(Class | x ) and P(x | Class). So what’s naive about Naive Bayes? 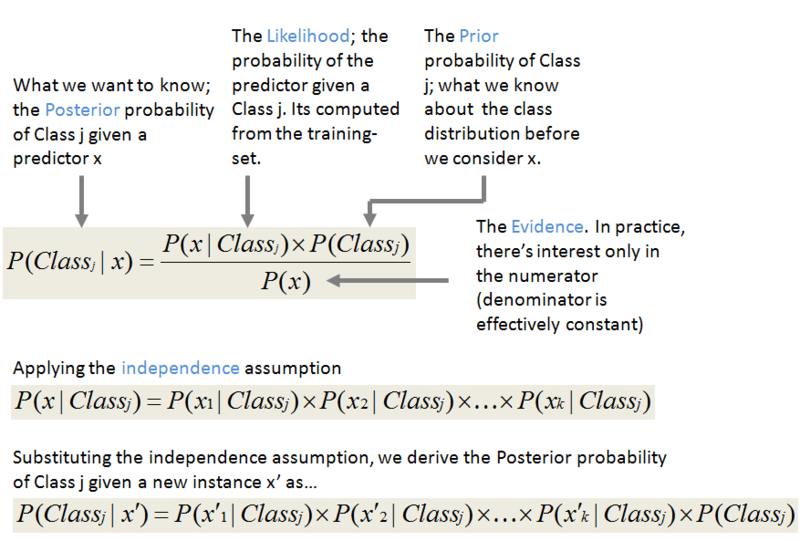 In plain English, if each feature (predictor) x is independent of every other feature, then the probability a data-point (x1, x2 …, xk) is in Classj is simply the product of all the individual probabilities of feature xi in Classj. 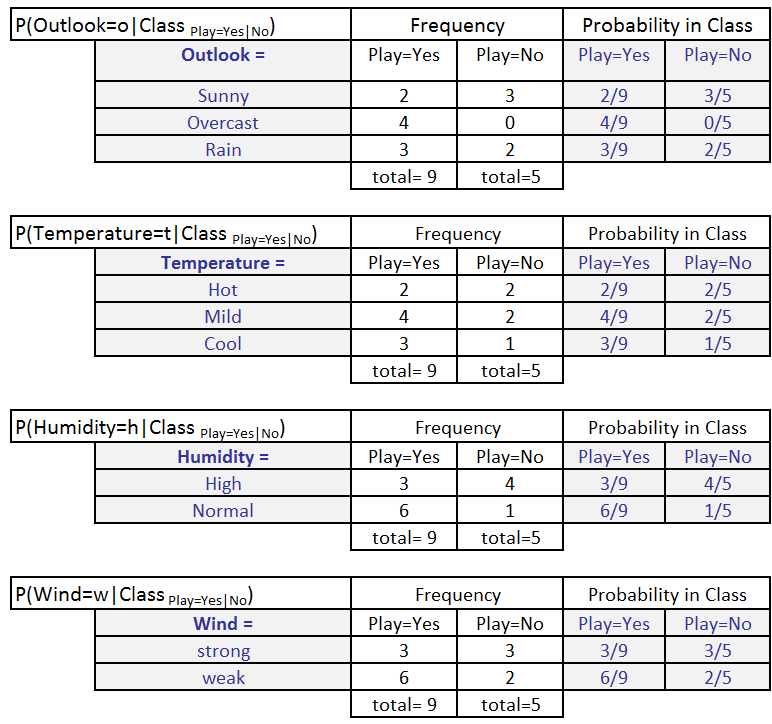 Let’s build a classifier that predicts whether I should play tennis given the forecast. It takes four attributes to describe the forecast; namely, the outlook, the temperature, the humidity, and the presence or absence of wind. Furthermore the values of the four attributes are qualitative (also known as categorical). They take on the values shown below. The class label is the variable, Play and takes the values yes or no. We read-in training data below that has been collected over 14 days. P(Wind=w|ClassPlay=b), where w ∈ [Weak, Strong] and b ∈ [yes, no]. We also calculate P(ClassPlay=Yes) and P(ClassPlay=No). 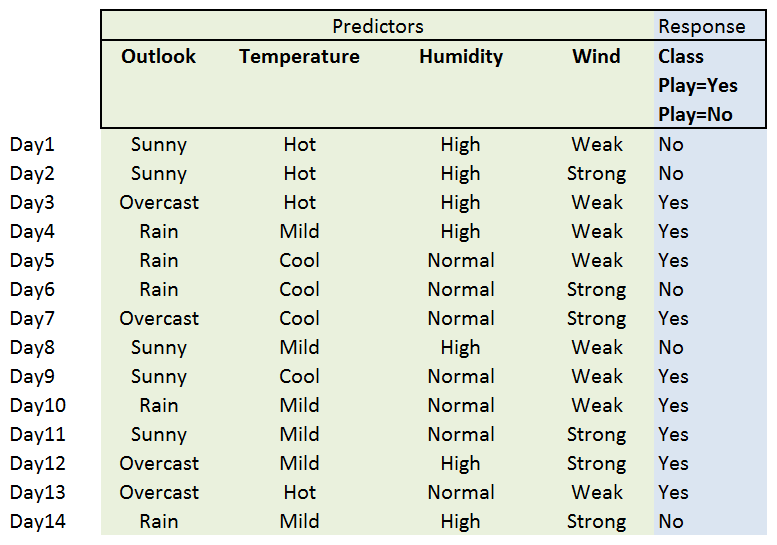 Let’s say, we get a new instance of the weather condition, x’=(Outlook=Sunny, Temperature=Cool, Humidity=High, Wind=Strong) that will have to be classified (i.e., are we going to play tennis under the conditions specified by x’). With the MAP rule, we compute the posterior probabilities. This is easily done by looking up the tables we built in the learning phase. Since P(ClassPlay=Yes|x’) less than P(ClassPlay=No|x’), we classify the new instance x’ to be “No”. The R code works with the example dataset above and shows you a programmatic way to invoke the Naive Bayes classifier in R.
Calculating the product below may cause underflows. P(x1 | Classj) × P(x2 | Classj) ×…× P(xk | Classj) × P(Classj). You can easily side-step the issue by moving the computation to the logarithmic domain.